STEM (Science, Technology, Engineering and Math) activities are all the rage in education. STEM concepts shape pretty much everything in the world. From the houses we live in, to the cars we drive, to the smartphones we absolutely can’t live without, STEM’s building blocks fuel our modern lives. But wait, how can kids learn the basics of physics, engineering and programming? It can be tough for children to learn these skills at an early age, however, toy makers are creating innovative new ways to get children interested in STEM concepts in an easy and fun way. Kids love homemade Flubber. Not to be confused with the Robin Williams movie, Flubber is stretchy slime with a rubbery consistency, so it doesn’t make a mess like other slimes. This is a super fun easy-to-make STEM project that your young kids will get a kick out of. Mix the glue and water together in a container. Stir the mixture well until you achieve a smooth consistency. Slowly add liquid starch and mix briskly with a spoon. Mix in food coloring or glitter if you wish – this adds a flashy touch your kids will appreciate. Now use your hands or a large spoon to mix the ingredients thoroughly. Continue to mix and knead the Flubber well for a few minutes. You are done! Set the Flubber aside for about 15 minutes to allow it to set up and you are ready to play away. Keep it loosely covered and your Flubber will stay good for at least a week. Have fun making your very own Flubber at home and have loads of gooey, slimy fun. Star Walk HD is a brilliant app that allows you and your kiddos to explore the stars together with the help of technology. It is an interactive Astro-guide to the night sky. The app follows every move you make in real-time as you and your toddler stargaze away and observe more than 200,000 celestial bodies. You can project Star Walk via a projector or big screen to create a homemade planetarium. The app tells you the names of all the planets. When you hold your device towards the sky, it shows you all the stars and constellations. Point it towards the ground and it displays the stars in the other hemisphere. It allows your preschooler to learn more about astronomy. Star Walk is an awesomely designed app that makes clever use of available technology. Your kids will learn about our galaxy and how to use tech gadgets at the same time. There is another app called “Star Walk – Astronomy for Kids” as well. This is a terrific app for young space explorers as it also introduces them to astronomy. The app features bright and colorful images with friendly narrators who provide fun and interesting facts about space. No matter what their age, children can begin to recognize planets of the solar system, constellations and learn about the fundamental principles of astrophysics. Why does day change into night? How long is a Martian year? Why was the Hubble sent into space? Use devices like your smartphone to teach young ones to use technology to learn in a fun way. Books on astronomy may be too complicated for preschoolers (with the exception of this one), but apps like these can make things simple and easy for them to understand. You can be sure that your little one will be fascinated by everything they see and learn on apps like these. 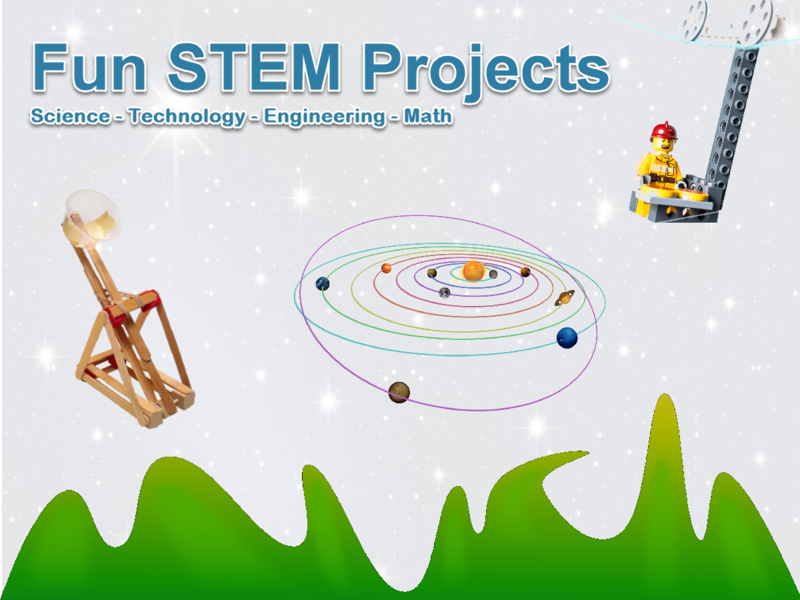 This is another awesome STEM project for kids of all ages. You will use technology to build the catapults and use math to determine the necessary supplies for building the catapults. For example, as you build, count-out the popsicle sticks. Engineering skills will actually go into building the catapults while science will help you test how far the Popsicle stick catapults fling the items you choose. For firing power, use marshmallows, pencil top erasers, or even paper balls. Which will fly the farthest? Predict and test the results. Quick your kiddos on why one type of projectile flies farther than the other. Take 2 popsicle sticks and tie them together with a zip tie making sure they are tight. Take your binder and wedge it between the 2 sticks. Take another zip tie and put it through the binder so that the binder clip does not pull away from the sticks. Again, make sure that it is nice and tight. Cut off the part of the zip tie that sticks out. Next, follow the same steps for the top. That is it! You have your popsicle stick catapult. Test it out and see which of your ammo flies the farthest and have loads of fun learning! Get your future engineer interested in fun, learning projects like these. There are many other simple yet fun and exciting projects that you can work on with your little one. The first thing to do is building a LEGO structure for a LEGO man to sit on. After this, set up the LEGO zip line – secure the parachute cord to a door handle and then position yourself and your little one so that you can be the anchor for the zip line. Keep the tension on the line and control the slope of the zip line by raising your arm up and down. You can increase the LEGO man’s speed by increasing the slope of the angle. You can stop or slow him down by evening out the slope angle. You can return him by decreasing the slope angle. You need tension on the cord to maintain the LEGO man’s travel. The LEGO zip line project is a simple yet enjoyable way to learn about angles and how increasing and decreasing them gives different results. It also introduces little ones to gravity. STEM activities are a must for preschoolers and children of all ages; it is never too early to start and you can even find many STEM projects that are ideal for toddlers as well. There are fun, hands-on projects that kids can use to find out how different things work. Preschoolers are at a curious age and ask a 101 questions about everything around them. With STEM activities, you can work with your children and keep them engaged while helping them prepare for the future which, without a doubt, will be filled with STEM. Go STEM and have loads of fun with your preschooler learning about how everything in our world works.